I will place on this page such data as can be found about the Asian, which was on location in Mid-Atlantic when the Volturno burned in 1913. It would seem that the Asian's involvement in the rescue was modest. But many of her crew were granted medals for their rescue efforts (see below), so they must have done something significant. Tony Jones, of North Wales, advises me that an article he has, written about an officer of the Asian, says that, in fact, the Asian conducted a search for the lifeboats that managed to get away from the Volturno. A difficult task indeed - to try to find tiny boats in a vast ocean with mountainous seas. Hopefully this page will expand as new data becomes available. For a very long time, I could find no references to the Asian at all, but I find that Irishwrecksonline.net, (website is here), has a page on the vessel, which hit 'The Stags' - rocks off the County Cork coast of Ireland - in Sep. 1924, & sank with the loss of a single life. I like to start off with an image of the vessel to give you a quick idea of what she looked like. And am pleased therefore to present the following image of the Asian. I read that the Asian was built in 1898 by Laird & Co., of Greenock, Scotland, a vessel of 5,514 tons powered by a triple-expansion engine. She was just over 420 feet long (420.6), almost 50 feet wide (49.1) (or 128.2 metres long, perpendicular to perpendicular) & owned by the F. Leyland Company, of Liverpool. She was built as the Colombian, O.N. 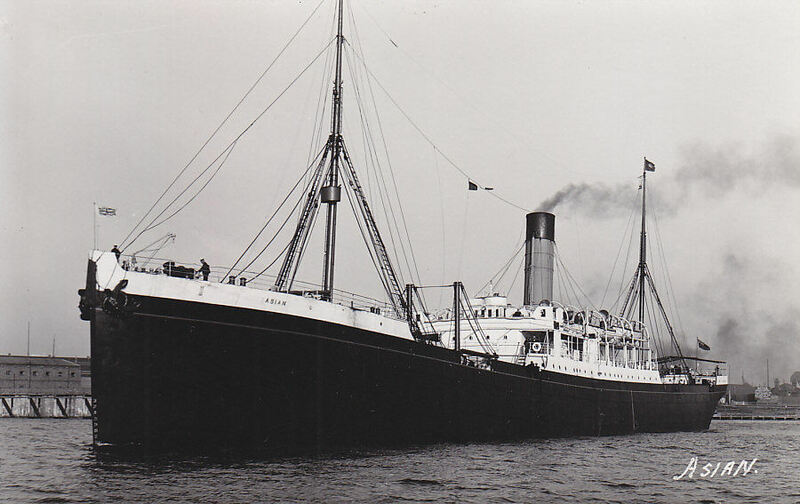 109466, in 1900 was taken over from West India & Pacific SS Co, & in 1903 renamed the Asian. Per this site at the Colombian (2) listing. Listed there as being 5,613 tons, however. And as per this Miramar listing for the vessel. The page linked above makes no reference to the Volturno incident but it does tell us that while en route to Liverpool from New Orleans, she struck 'The Stags' - rocks off the County Cork coast of Ireland, in fog during a severe gale on Sep. 17, 1924 & broke in two. HMS Seawolf based at Berehaven, heard her radio distress message, transmitted before her mast fell, & responded to the call. The crew took to the lifeboats but one crew member was lost when two of the Asian lifeboats overturned. Seawolf took the survivors to Bantry. The Dutch tug Wittersee was on the scene also but there was, I presume, nothing to tow, alas. The wreck is available to divers today, hence the 'dive site' listings referred to on this page. On Jan Daamen's site there is a list of the crew of the Asian provided by Tony Jones of North Wales. Here, with his kind permission, is Tony's list, which I believe is of medal recipients re the Volturno rescue. 8 names in total. Thank you, Tony! All of the recipients listed above, except only for Captain Wood, received the Sea Gallantry Medal (SGM), a very prestigious medal indeed. The list of SGM medals on page 32 of this site states boatswain Riordan's initial to be M.
Tony Jones advises me that the crew of the Asian were not granted awards of the 'Liverpool Shipwreck and Humane Society' because the Asian apparently didn't take an active part in the actual rescue. I am advised that the Sea Gallantry Medal awarded to John McCallister, Ordinary Seaman, in a good very fine condition, was sold at a Dec. 4, 2008 auction by 'Dix Noonan Webb' of London. The hammer price was �400, I find. And it would appear that the same medal came up for auction about 30 years earlier, at a 1979 sale of 'Spink & Son'. And on Mar. 19, 2008, the Sea Gallantry Medal awarded to James Allen, Ordinary Seaman, in a very fine but with slight edge bruising condition, was sold at auction by 'Dix Noonan Webb' of London. The hammer price was �360. If you check the first data link earlier on this page you will see that the data about the vessel comes from a number of original sources. I am always delighted to see such references & repeat them here with some modification so that visitors have a start point should they wish to search for additional data. Only item a) seems to be available in my own city's Reference Library - Toronto, Ontario, Canada. a) Charles Hocking's 'Dictionary of Disasters at Sea during the Age of Steam 1824-1962'. Published in 1969 by Lloyd's Register of Shipping in 2 volumes. And republished by London Stamp Exchange - ISBN: 0948130474.
b) Dr. Edward J. Bourke's 'Shipwrecks of the Irish Coast'. A series of three volumes published by Dr. Bourke. (ISBN numbers of Volumes 1 through 3 are 0952302705, 0952302713 & 0952302721). Available at �15.22 each from booksellers & direct from Dr. Bourke. References to the Asian are in Volume 1, I believe. c) The Irish Underwater Council's, 'Underwater Ireland Guide to Irish Dive Sites'. Published in 1999 by CFT - ISBN: 0948283025. I think I have that data correctly, but by all means check the first link, to which I supplemented some book searches & data received from Dr. Bourke. Maybe you can provide additional Asian images? Or data? This page will, hopefully, track data about the Asian as it comes to hand. And hopefully data as it specifically relates to the Volturno tragedy.